To open the search dialog, press Shift + S on your keyboard. If you are in the day view you can also click the magnifying glass icon at the top right. Then type in a keyword to find the item you need. 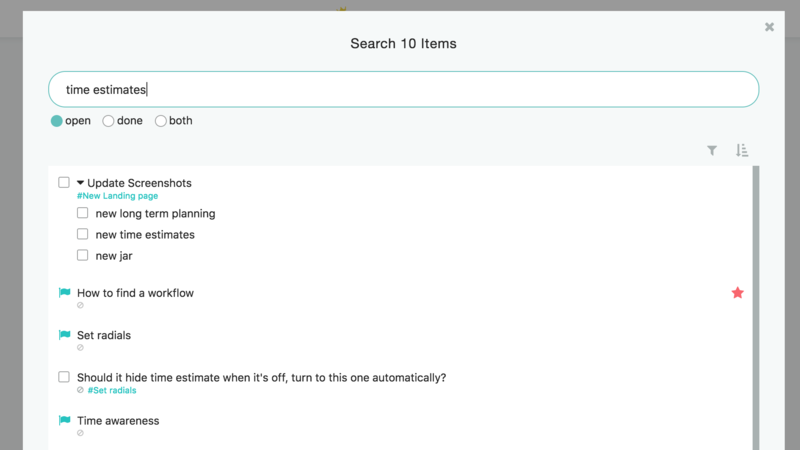 It will search the title of the item, the note and subtasks (for tasks). Underneath the search bar you can select to only search open or done items. On the right you can also filter your results (e.g. by category). And finally, you can sort the entire search results on the right. By default the search list shows you any items you most recently modified at the top. This can be very helpful if you accidentally changed a task and then can't find it (e.g. when scheduling it to a wrong day for example in the day view).